Despite the initial vote to keep the Breckenridge troll where it is, it was taken down on Thursday. 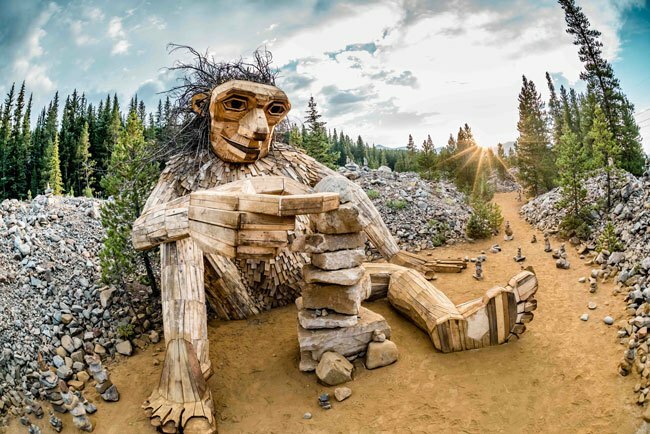 Back in October, OCN reported that the ever-popular Isak Heartstone, the 15-foot Breckenridge troll that captured many a heart over the last few months, was here to stay after being voted in by the Breckenridge City Council. However, we're sad to announce that despite that initial vote, Isak is now gone. On Thursday, November 15, crews began to dismantle the wooden troll due to the City Council reporting public safety concerns as the reason for its removal. Created by sculpture artist Thomas Dambo, the piece was constructed for an arts festival that happened over the summer. The Breckenridge troll drew in crowds far and wide to the 1.3-mile trail, but due to the influx of visitors, many nearby homeowners were not happy about its appearance, stating that it caused several issues for the neighborhood, like illegal parking, trespassing violations, and noise complaints, among others. "If it was in a place where it was safer and easier to get to, and if didn't have an impact on the local neighborhood, then I'd be fine with keeping it," said Mayor Eric Mamula of Breckenridge in a statement by OutThere Colorado. "But because of those three things, it's time." Thomas Dambo shared on Facebook images of Isak Heartstone being dismantled, saying, "It breaks my heart to see... But hope they will salvage the Heartstone so his soul can live on if we find a new home for him." What do you think? Do you think the Breckenridge City Council made the right decision in removing the troll? Why or not? Share your thoughts with us in the comments below. Skip the stress with these Colorado Thanksgiving destinations!